This children's book discusses the stealth aircraft known as the B-2 Spirit, its uses, engines, weapons, and future in the U.S. Air Force. 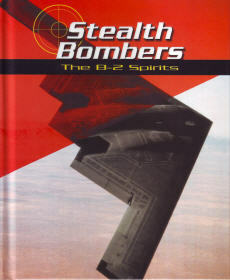 Stealth Bombers book: Reading Level: Grades 3-4, Interest Level: Grades 3-9, Ages 9-12, 32 pgs, hardbound w/Library Binding. TOP QUALITY.